represents the Erlang distribution with shape parameter k and rate λ. The probability density for value in an Erlang distribution is proportional to for , and is zero for . ErlangDistribution[k,λ] is equivalent to TransformedDistribution[x1+…+xk,…] with each xi from ExponentialDistribution[λ]. ErlangDistribution allows k to be any positive integer and λ to be any positive real number. 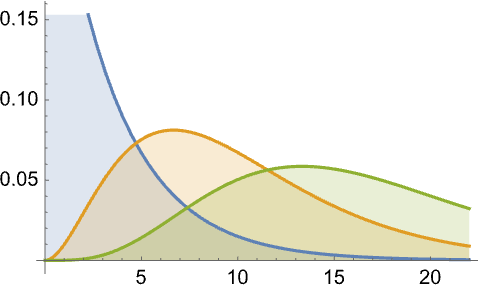 ErlangDistribution can be used with such functions as Mean, CDF, and RandomVariate. The Erlang distribution was proposed by Danish mathematician and statistician Agner Krarup Erlang in the early 1900s as a tool to model phone call frequency. In the ensuing years, the Erlang distribution has become a regularly utilized tool in queueing theory, particularly for modeling a queue's conditional waiting time, given its current system state. 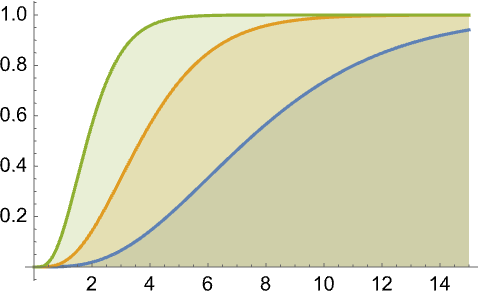 For example, upon entering a queue that already has three people in it, the anticipated wait time would satisfy TErlangDistribution[3,λ], where λ is the reciprocal of the mean service time per person. RandomVariate can be used to give one or more machine- or arbitrary-precision (the latter via the WorkingPrecision option) pseudorandom variates from an Erlang distribution. Distributed[x,ErlangDistribution[k,λ]], written more concisely as xErlangDistribution[k,λ], can be used to assert that a random variable x is distributed according to an Erlang distribution. Such an assertion can then be used in functions such as Probability, NProbability, Expectation, and NExpectation. 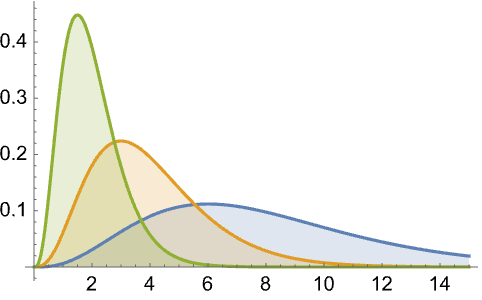 The probability density and cumulative distribution functions may be given using PDF[ErlangDistribution[k,λ],x] and CDF[ErlangDistribution[k,λ],x]. The mean, median, variance, raw moments, and central moments may be computed using Mean, Median, Variance, Moment, and CentralMoment, respectively. DistributionFitTest can be used to test if a given dataset is consistent with an Erlang distribution, EstimatedDistribution to estimate an Erlang parametric distribution from given data, and FindDistributionParameters to fit data to an Erlang distribution. ProbabilityPlot can be used to generate a plot of the CDF of given data against the CDF of a symbolic Erlang distribution and QuantilePlot to generate a plot of the quantiles of given data against the quantiles of a symbolic Erlang distribution. TransformedDistribution can be used to represent a transformed Erlang distribution, CensoredDistribution to represent the distribution of values censored between upper and lower values, and TruncatedDistribution to represent the distribution of values truncated between upper and lower values. CopulaDistribution can be used to build higher-dimensional distributions that contain an Erlang distribution, and ProductDistribution can be used to compute a joint distribution with independent component distributions involving Erlang distributions. The Erlang distribution is related to a number of other distributions, including the exponential distribution (through its definition). ErlangDistribution is also a special case of both GammaDistribution and PearsonDistribution, in the sense that the PDF of GammaDistribution[k, 1/λ] and PearsonDistribution[3, 1,(-k + 1)/λ, 0, 1/λ, 0] are both precisely the same as the PDF of ErlangDistribution[k,λ]. 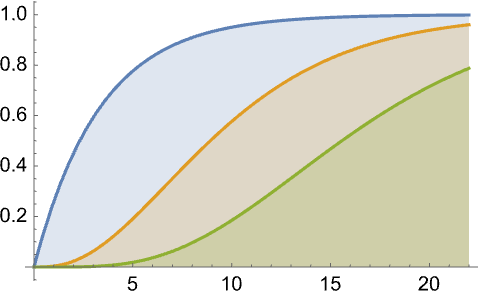 ErlangDistribution[k,λ] converges to NormalDistribution[k/λ, /λ] as k tends to Infinity, and ParetoDistribution can be obtained as a quotient of ExponentialDistribution and ErlangDistribution. Moreover, ErlangDistribution is related to a transformed ChiSquareDistribution, through which it inherits relationships with NormalDistribution, LogNormalDistribution, RayleighDistribution, WeibullDistribution, and MaxwellDistribution.